Commercial HVAC Geothermal Heating is a discipline that is not that well-known, but it is extremely important. If you have even been to a sporting event, stopped off at the courthouse, sent your kids to school or done a lot of other random things that require the use of a large building, then chances are you have made use of this type of heating and not even been aware of it. The commercial HVAC Geothermal heating method is extremely flexible and that is one of the main reasons why schools, government buildings, skyscrapers, restaurants and many other commercial buildings have this type of heating option extremely useful. The geothermal heating method will also give these property owners the benefit of lower maintenance costs, diminished operating expenses, the benefit of a super durable system and excellent energy conservation features. Moreover, one added benefit to utilizing a geothermal HVAC unit would be in simply considering how versatile the system truly is. 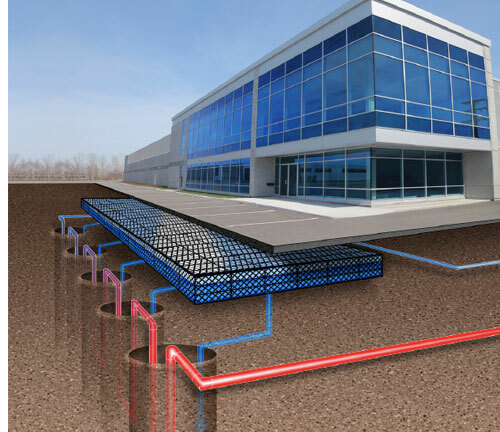 One surprising consideration would be that a geothermal HVAC unit has such precision that they actually can both heat and cool the same building but in different parts of it. Naturally, this makes building owners and property developers more drawn to it simply because they can save money and “kill two birds with one stone”, so to speak. Another great thing about the geothermal commercial HVAC unit would be how quiet the system is. This is yet again another indicator of the efficiency of the system. Not only does this system heat and cool a humongously large area, but they also do it in a quiet manner. Many individuals have reported they cannot even tell that the system is operating. The geothermal HVAC equipment can also be set up in multiple zones, and they can allow each area to have their own zone and environment control setting. This makes it an extremely convenient option for business owners of both large and smaller buildings alike. Finally, when it comes to a geothermal unit durability is their middle name. All of the pipes associated with a geothermal HVAC unit can easily last as long as fifty years without having to be replaced. This means that if another installation is indeed required it will only need to be done perhaps only once every generation. Of course, it is also important to some degree to understand how a geothermal HVAC unit works to heat and cool your commercial area. First of all, a geothermal HVAC will use the natural temperature of earth in order to provide for any heat changes. They will also usually rely on heat transfers from the air to the ground to heat their target buildings. Moreover, there are two other forms of geothermal HVAC systems, including the direct use system and the deep and enhanced version. The direct use system will normally be seen in areas that have either a lot of volcanic or tectonic activity. The groundwater is normally already natural heated in these areas, so the direct use system will usually take advantage of this water in its current form. The deep and enhanced system will provide electrical applications for farming, industrial and other large commercial areas. As you can see, a geothermal heating system is definitely important in our world. It will only continue to grow in the coming years.